I buy a lot of old Army manuals off of eBay. I’ve found that purchasing these manuals on-line is a good, cheap way to build up a library of publications. Plus, there’s the thrill of the hunt! I don’t think I’ve paid more than $10 for a commonly available manual. Most are well used, some downright raggedy. A surprising number will contain an individual’s name, unit and occasionally a service number. One series of manuals I’ve focused on is the Army map reading manual series. Starting about 1938 the Army realized it needed to develop the standardized procedures necessary to teach map reading and land navigation to millions of young draftees. 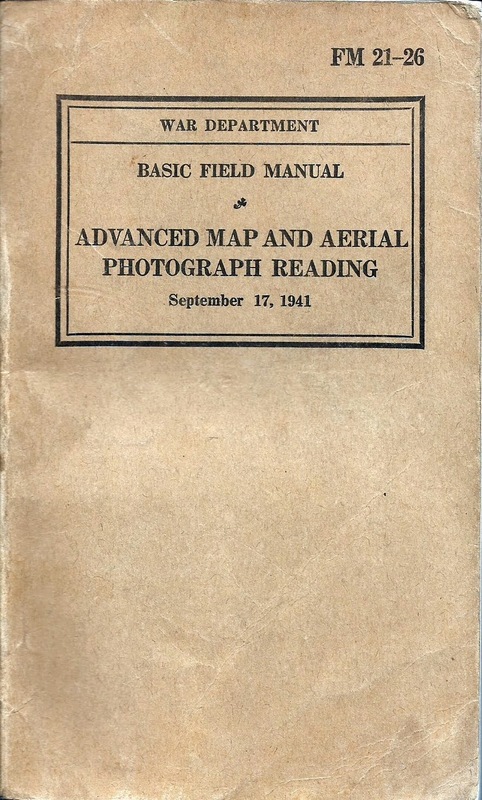 The Army introduced map reading manuals (FM 21-25 & 21-26) that received regular updates between 1938 and 1945. I’ll do a blog post on the evolution of map reading and land navigation during WWII at a later date. Today want to focus on one specific manual that contains some interesting historical references. 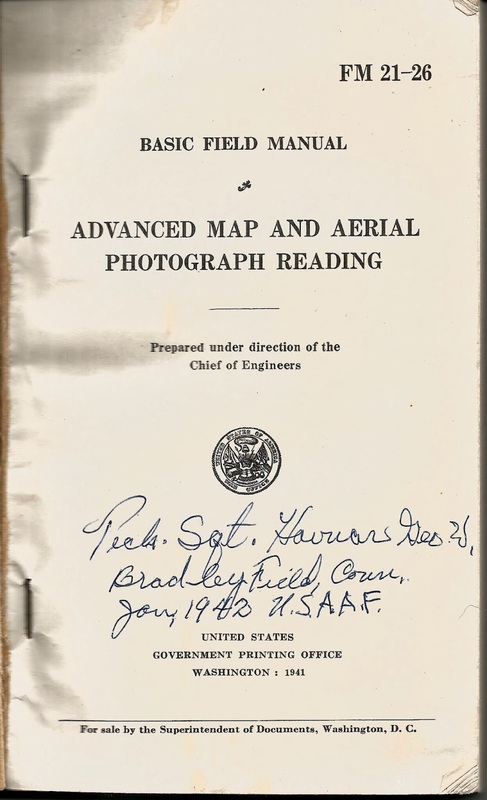 During WWII the Army split map reading and land navigation into two separate manuals – FM 21-25, Elementary Map and Aerial Photograph Reading and FM 21-26, Advanced Map and Aerial Photograph Reading. FM 21-25 dealt mainly with the skills the common Soldier would need to master – map symbology, map orientation, interpreting contours, locating your position, basic map and compass work, etc. FM 21-26 dealt with more complex topics, the sort of things NCOs and officers would apply, like advanced coordinate determination, time-distance calculations, determining intervisibility using contours and advanced aerial photo measurements and interpretation techniques. It is common to find WWII-era copies of FM 21-26 with staff section – S2 or S3 – markings in them. This was not a manual for the common Soldier. The manual under discussion today was purchased off of eBay in 2013. I bought it because it filled a hole in my collection. September 1941 is, as far as I can tell, the first publication date for this manual. The seller listed it as a run-of-the-mill manual, noting it’s condition as good and containing the previous owner’s information on the title page. There was nothing unusual or unique about manual noted in the auction description. 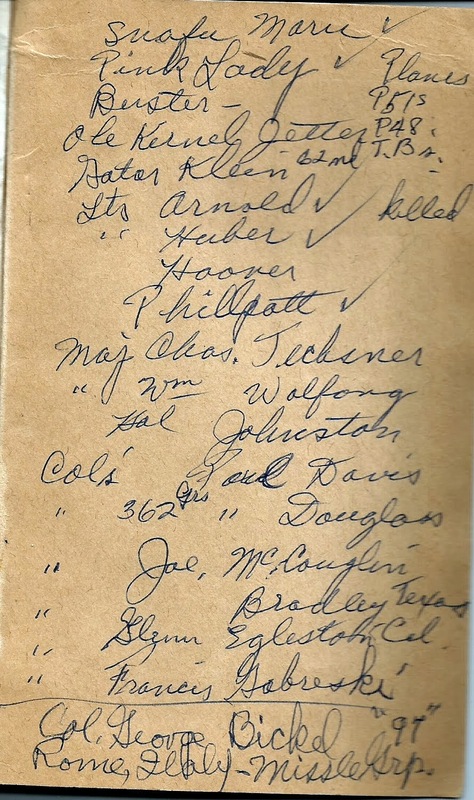 The name was a little difficult to decipher, but I believe this is a George W. Havnar, Jr. who was born in 1918 and enlisted in the Army in January, 1941. It’s plausible that, in the fast expanding Army of 1941, he could have made the rank of Technical Sergeant after just one year of service. 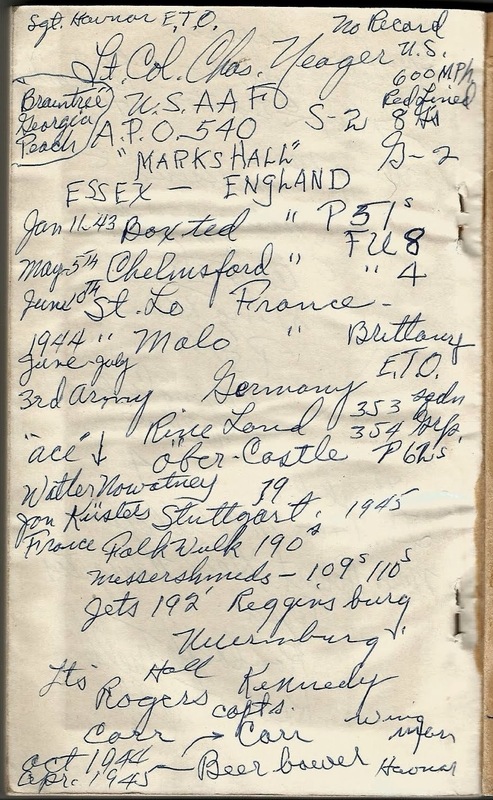 The back pages are a listing of personnel names, units, locations, aircraft and operations that seem to trace the US Army Air Forces march across western Europe. The chronology is hard to figure out, and it’s clear a lot of this was written down long after WWII ended, but there’s a lot of interesting history recorded in these pages. The Chuck Yeager? 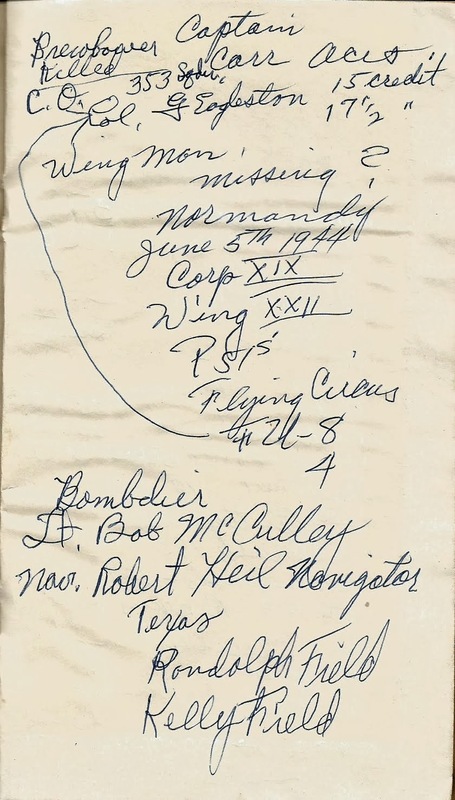 I don’t believe there was another Charles Yeager serving in the Army Air Forces in WWII, and since Chuck Yeager was a captain when WWII ended this inscription had to have been made post-WWII. There’s two interesting names here. 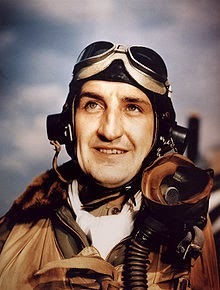 First, Francis Gabreski was the top fighter ace in Europe during WWII. 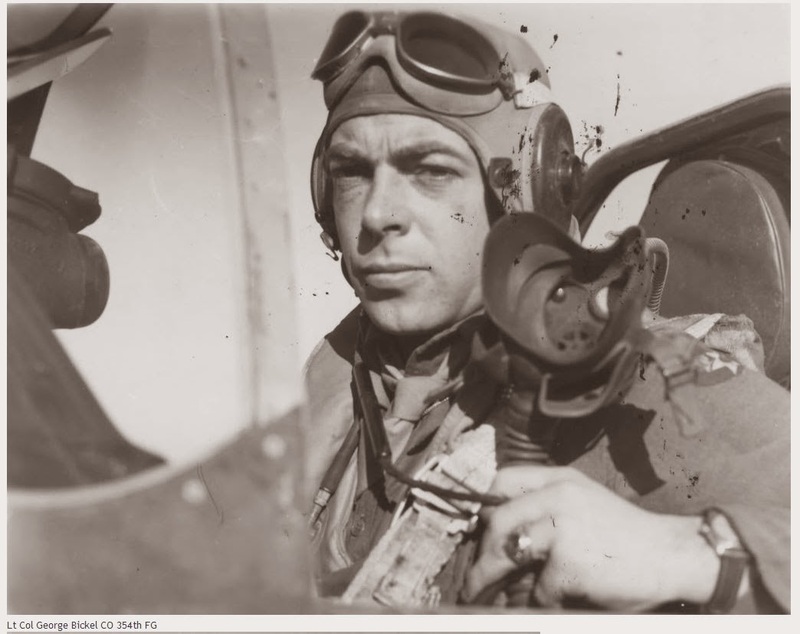 As good a pilot as Yeager was, ‘Gabby’ Gabreski was better, at least when it came to shooting down Germans. Because of the disconnected nature of many of the entries, and the clear discrepancy between some of the personnel entries and their wartime ranks my suspicion is that Tech. Sgt. Havnar used this manual as a place to jot down references and remembrances of his service long after the war ended. There’s a date of 9/11/63 written on one of the pages, not connected to any other entry. Perhaps he took the manual to a reunion in 1963 and sat around a table with some wartime buddies and just started jotting down notes as they swapped old war stories. We’ll probably never know, but it’s certain that Sgt. Havnar had a keen interest and pride in his service and the Army Air Forces squadrons he served in. This entry was posted in History and tagged map reading by Brian Haren. Bookmark the permalink.